To provide a novel, robust algorithm for classification of lung tissue depicted by multi-detector computed tomography (MDCT) based on the topology of CT-attenuation values and to compare discriminative results with densitometric methods. 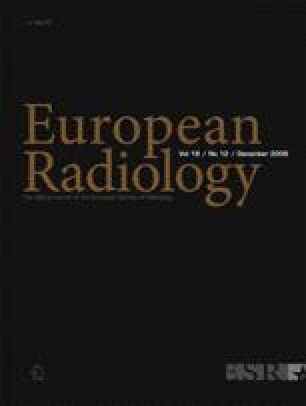 Two hundred seventy-five cubic volumes of interest (VOI, edge length 40 pixels) were obtained from MDCT chest CT (isotropic voxel size, edge length 0.6 mm) of 21 subjects with and without pathology (emphysema, fibrosis). All VOIs were visually consensus-classified by two radiologists. Texture features based on the Minkowski functionals (MF) as well as on the CT attenuation values are determined. Classification results of both approaches were assessed by receiver-operator characteristic and discriminant analysis. By densitometric (topological) parameters, normal and abnormal VOIs were distinguished with an area under the curve ranging from 0.78 to 0.85 (0.87 to 0.96). Correlation between both groups of parameters was non-significant (p ≥ 0.36). By combined information of densitometric and topological quantities, the radiologists’ ratings were reproduced for 92% of VOIs, ranging from 85.7% (fibrosis) to 98% (normal VOIs). Our method performs well for identification of VOIs containing abnormal lung-tissue. Combined information of densitometry and topology increases the number of correctly classified VOIs further. When extended to CT data depicting whole lungs, topological analysis may allow to enhance density-based analysis and improve monitoring texture changes with progression of pulmonary disease.